Welcome to Google+, your next social network? It has been only a week. I bet The Facebook, as it was known early on, wasn’t that interesting in its first week. It’s not my raison d’être. I don’t want to be a pioneer in G+; all I want to do is quickly assess the best way to use it personally and professionally, and how it might (might) help your business grow. Google+ rolled out last week to a select few, but has grown through controlled periods allowing invitees to enter the beta social network. Many people are fond of Google’s other services (including me), such as Google Docs, Maps, Picasa (soon to be Google Pics) and more. You will find the now familiar elements of popular networks Facebook and Twitter. For starters, you have a stream of updates from your connections, including text, photos, links and videos. The interface still needs work: Imagine scanning your Facebook wall and having to scan past 100-plus comments on a popular post with no way to collapse the thread. One of the most discussed features is how G+ organizes connections. Like Twitter, you can “follow” others and they can follow you, but no reciprocity is required (as mandated in Facebook). I could add up to 5,000 people to each of my Circles, and still only have 12 people follow me (or vice versa). The Circles are how connections are organized. I can have as many Circles as I want: Friends, Close Friends, Relatives in Idaho, Co-Workers, Gun Club Buddies and so on. I can put my pal Johnny in both Friends and Gun Club Buddies, and my boss Sheila in Co-Workers. A Circle can even have zero connections, which you could use for Drafts or Bookmarks. drag and drop in Google+. Johnny and Sheila can set up their own Circles, with or without me in any of them. The only difference? It’s mandatory to immediately classify each Google connection in a Circle, not so in Facebook. To me, it’s extra work and brain power to have to classify someone on the spot, then eventually have to reclassify later. You can read the stream, or narrow it by Circle, just like in Facebook. Circles and Facebook Friend Lists, by the way, are invisible to anyone but you — handy if you have one called Loud-Mouthed Jerks. Sharing is also similar to Facebook. One advantage is you can drag and drop photos, videos and links to the sharing box, though I haven’t been able to make it work consistently. Sharing in Google+ puts a premium on privacy and targeted information. The confusion arises in if what you actually share makes it to your intended audience. For example, if I share something with just my Co-Workers Circle, I’m intending for my boss Sheila and the 25 others in my department to see it. But will they? If Sheila has me in a Circle, let’s say Underlings, then yes, she will see it if she happens to be on G+ at the time, mixed in with other updates from those peons. But what if Sheila hasn’t added me to a single Circle (sniff!)? She could see my G+ posts if she clicks on the Incoming stream, designed to harness all those posts from unmade connections. When I click on Incoming, I see a stream of not-very-interesting posts from complete strangers. In any stream, I can Mute a Post (hide it) or Block a Person (hide everything from and to someone). You can undo either Mute or Block at any time. Better ways to combine and mute Circles will come in handy if they choose to add that functionality. By the way, all that +1 jazz applies only to websites, but not within G+ itself. I could mark 100 posts, photos and updates with +1, and it will be visible only to the original sharer and people within those Circles. 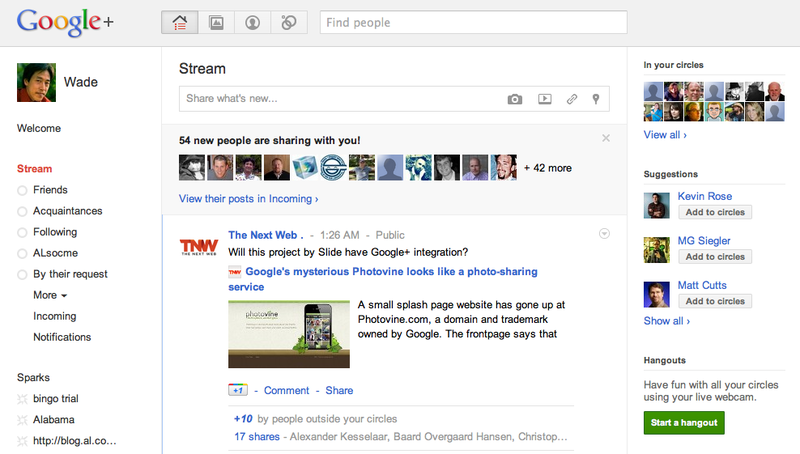 That’s right: The +1 button behaves differently within Google+ than outside of it. One feature I look forward to trying out is Hangouts, video chat and screen sharing with up to nine other people, whether within a specific Circle or a select few. I’ve been told it’s easy to set up and use. I’m also just vain enough to admit I don’t know if I’m ready for the bold new future of video calls all the time. whether jamming on music or ideas. The other notable feature is Sparks, which allows you to pick keywords, topics, even URLs to follow. However, it doesn’t work very well yet. Also not available yet is an official Search function, which is very useful for me to monitor trends in Twitter and Facebook. You can still search externally using Google, and I would tell you how, except that someone shared it in G+ and naturally, I can’t find it. Time for your company to jump in? The million dollar question to be answered is how businesses can leverage this new network for their nefarious ends. Google has promised separate profiles for businesses, while also promising to remove commercial profiles for the time being. This hasn’t stopped Ford Motor Company, one of the more adept brands in social media, from creating a profile that has yet to be excised. Should your company be on Google+? When you’re ready to ask that question, contact me. For 99 percent of companies, the answer is no … for the time being. Most of them are probably underutilizing the more established social networks, not to mention their own email lists and traditional media mentions and buys. Should you be on Google+? If you don’t mind being Google’s guinea pig, head to plus.google.com to see if you can get in. Or contact me for an invite and include your email address. The future could be Google+, but the future looks a lot like right now. What are your first impressions of Google+? Loving it, or finding it meh? Let us know in the comments. Connect with Wade Kwon on Google+. Need a Google+ invite? Contact me. More on social media and blogging every week. Sign up for our free e-newsletter today! Oh dear…I didn’t need this 🙂 Another place to be. I have seen several people asking if we wanted invites to this and I had no clue what they were talking about, so now I know 🙂 Is this intended to replace Facebook or be a side kick? Google intends it to be a Facebook killer, don’t doubt that for a second. But we get to decide. Just remember, millions said they’d never ever do Facebook, and now they’re happily Poking and Liking and playing Mafia Wars. Thanks for the review Wade! I’ve been looking for a “real” opinion about G+ to decide if i even WANT an invite… Sounds pretty cool so far. I’m liking Circles and I think Hangouts has potential in the future. You’re welcome, Josh. Were you using Friend Lists in Facebook? Do you see good potential for photographers in Google+? I know some were concerned about loss of ownership of photos if uploaded to Facebook. I can’t see your +1 button on this post. Which I would like to push, because I love this post! Ah, now I can see it! I should’ve rigged every link on this post to give it +1. P.S. I tested this post with all of your moms for readability and ease of use. Great information, Wade. Thanks for the educated opinions as well. I think I’m going to let Google+ finds its own way before I jump in with both feet. Thanks, Sherman. That is a wise idea. great article… Google+ seems to have potential… I am in and have a profile. After that I haven’t done much. It took me forever to get on the Facebook band wagon, and now that I am there I really like it. Untill all my friends leave me alone on FB, I will probably just do most of my social media there and on Twitter. I really don’t need a 3rd thing to check! Or in my case, a 12th thing to check. 🙂 Thanks for your insights, Melissa. I’ll keep you posted on the Google+ front. Thanks for your great explanation of Google+. I’m still not sure if I want to do it or not. I do like the ideas of Circles, but it seems like I might miss some things from people if I’m not careful how I set it up and then how I check it. I’m still not sure either, Kris. I’d like to try out Hangouts and I hope they’ll add screen sharing to it. Then, it might be worth more time for me. Thanks for your comment.